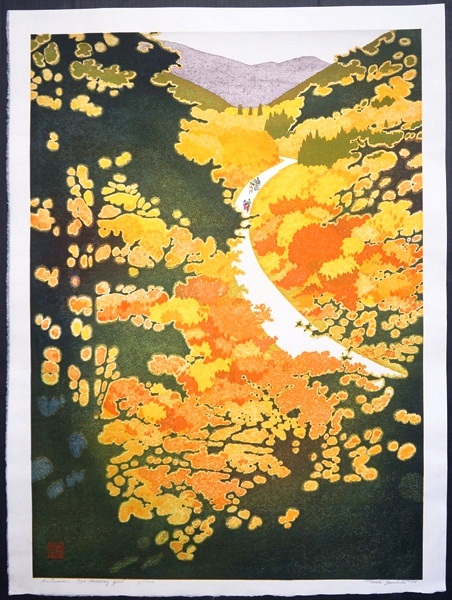 Three Toshi Yoshida prints came up for auction recently and whilst I don’t own them I’ve posted images of them here for reference as they are rare prints. I’ve definitely not seen the first two before, the third is a little familiar but I’m not sure. The images of the prints all appeared to be photo’s of the prints which tends to wash out the colours (as opposed to scanning which does the opposite, it usually enhances the colours). I’ve therefore tweaked the colour on all the images a bit. I adjusted the ‘detail’ images just to make the titles etc clearer to read. 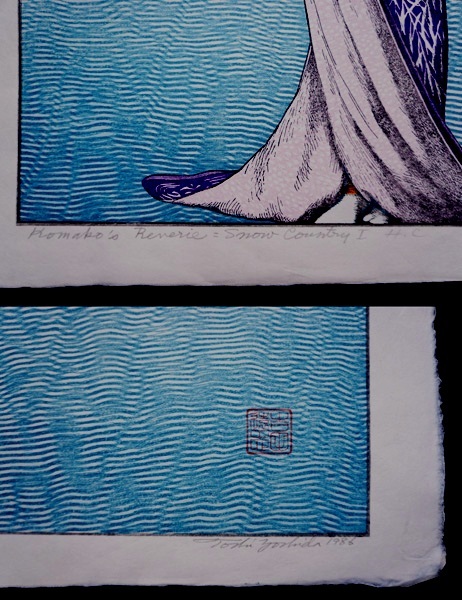 I’d be interested to hear if anyone has seen these prints before and knows if they (the two marked H.C) actually went into production, were they open editions or a limited edition. 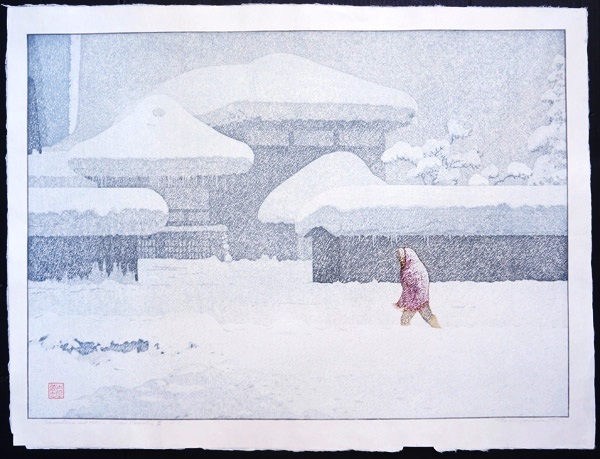 Given the image size of “Komako’s Reverie = Snow Country I” I suspect that print would possibly be a limited edition but it’d be great if someone has any info on these prints. Dave Bull (from http://woodblock.com and http://mokuhankan.com) has provided some background information about these prints in the comments section below so be sure to read that. This print is pencil signed, dated 1986 and is annotated H.C (Hors Commerce) so is not from the ‘for sale’ production run – assuming there was one? 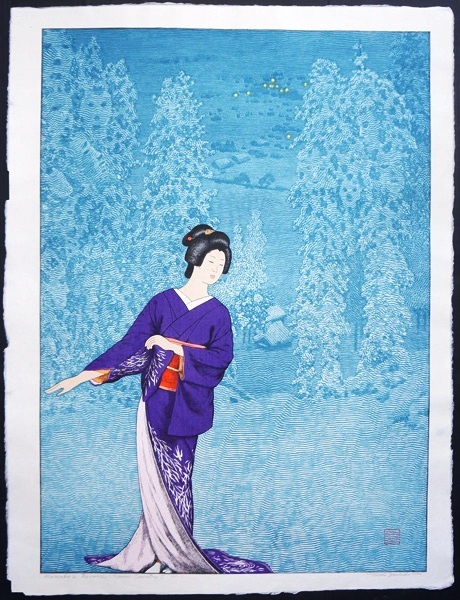 The print is large at 28 x 20″ plus margins. It was auctioned in Japan and then resold on eBay for a healthy $1000USD. This print is pencil signed, dated 1986 and is annotated H.C (Hors Commerce) so is not from the ‘for sale’ production run – assuming there was one? Unfortunately I didn’t note the measurements for this and the following print. This print is pencil signed, dated 1988 and is a limited edition print numbered 1/100. The ‘Izu’ part of the title is not to clear but I think it’s correct. 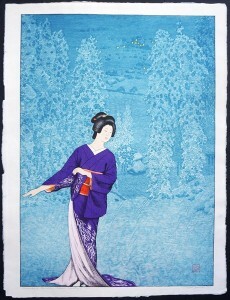 Toshi produced another print called “Izu Dancing Girl” in 1988, that one predominately shows a dancing girl. 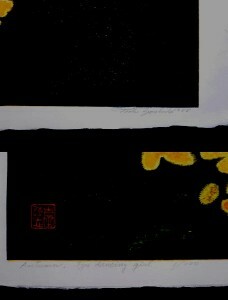 These prints are editions made by Toshi-sensei for a commission that came to him from the Nobel prize committee in the mid 1980-s. They wanted to have some special items honouring Kawabata Yasunari, who had previously been awarded the prize for literature. 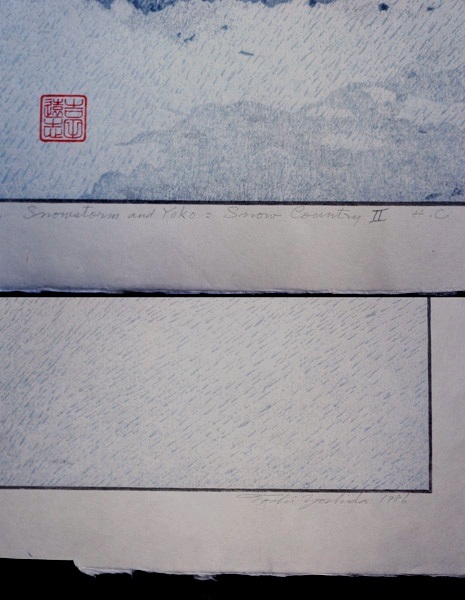 Two of these (Snow Country, and Komako’s Reverie) were being proofed at the time I was working in the Yoshida studio in the autumn of 1986. 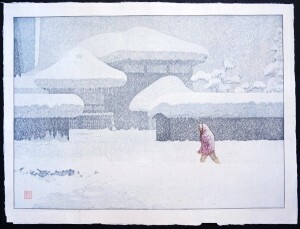 I was able to observe quite a bit, as Mr. Yoshida and his wife worked together with printer Komatsu-san on the Snow Country print. One day he brought something to show us – the letter that he had received from the Prize Committee commissioning the works; he was quite proud of the fact that no price had been set – this was completely up to his own discretion. Thanks for the information on these prints. I hadn’t previously seen them anywhere so it’s great to now have some background about them. Another detail I remember about this set is that it was my first experience of seeing the Yoshida zinc blocks. The figure of Komako is not carved in wood, but is done with a zinc plate (produced by a commercial company from Toshi-san’s drawing). The colours were then printed in the normal way with wood. 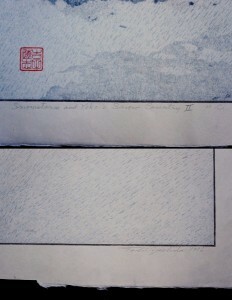 I think for these prints it would have been shina plywood; that’s what was used for the Snow Country print, certainly. A lot of the snow on that one was done with an interesting technique. They carved a positive block for the snowflakes (the largest ones) and then pressed the paper over this (with no pigment), to leave it deeply embossed. They would then print the relevant area again using a completely flat block, inked with a light pigment, but using only a very light pressure. The embossed places would not be pressed down onto the wood, and would thus remain white, while the unembossed area would catch the colour. Hiroshi-san used this technique too, I believe. Snowstorm and Yoko is a fairly large print – and supposedly there were only about 10 copies made – at least that’s what I was told. Thanks for that information on these prints. My copy is an edition of 100.